firewalld is a Linux firewall management tool which provides a dynamically managed firewall with support for zones. The core layer: Handling configuration and backends. 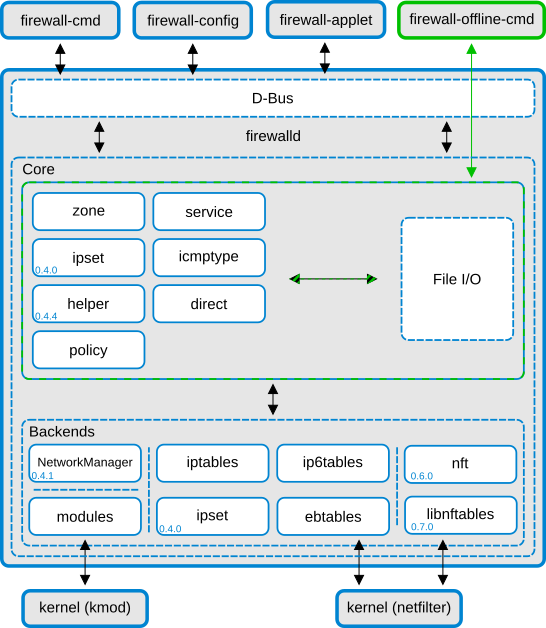 The D-Bus layer: Interface to various tools which alter and create the firewall configuration. firewalld separates runtime and permanent configurations. The runtime configuration is valid till the next reload or restart, at which time the permanent configuration will be loaded again. firewalld is a easier-to-use front end of iptables (and other tools). When you change configurations in firewalld, the underlying iptables will be changed accordingly. However, if you decide to stick with firewalld, then refrain from editing iptables directly, unless for some very complex rules. As mentioned above, firewalld has two separate configuration sets: runtime and permanent. By default, firewall-cmd configures runtime. To configure permanent, add option --permanent. A zone is a set of rules representing a degree of trust. Example zones are home, work and public. Default zone is public. firewalld can regulate traffic by services. Example services are http, ftp, squid, ssh. firewalld has pre-defined services, and users can also create their own custom services. It may happen that a service is deployed using non-standard ports. In this case users can configure ports directly. Example <proto> is tcp or udp. Rich rules allow users to create complex firewall rules without the knowledge of iptables syntax. Direct options give users a more direct access to the firewall. This requires users to know basic iptables concepts.